The Schurtzen, in this kit (Tamiya, 1/25) are excellent! .... just for some other vehicle, it is grossly inadequate for any JagdPanther! As a result, I scratched built a set for this model. All individual plates can be removed and will not be permanently attached until all painting and finish detailing is complete. Ostatnio zmieniony 15 września 2017, 06:21 przez TankIndustry, łącznie zmieniany 2 razy. Now I see big pics. I wait for the moment You use airbrush. Equipment and tools poorly detailed. The pictures below indicate the work done. ... just the road wheels to correct and it will be ready for paint! Ostatnio zmieniony 19 listopada 2017, 06:25 przez TankIndustry, łącznie zmieniany 3 razy. 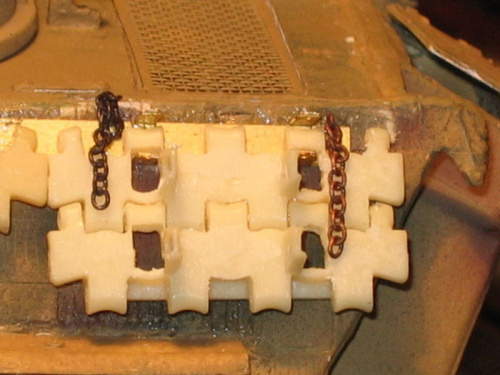 Do You plan to add chains like my tank? Tamiya, Dark Yellow base with Tamiya, Red Brown and Flat Green cammo. The ones below feature a dilute overspray of the base color. This subtly reduces the contrasts and results in a more blended appearance as well as suggesting it's seen some field action. Ostatnio zmieniony 25 grudnia 2017, 21:55 przez TankIndustry, łącznie zmieniany 1 raz. I`m waiting for the next steps, what we talk about via messenger. Bardzo ładnie, pozostaje tylko czekać na wykończenie. I'm looking at your work for a long time. I am impressed by the work you have done. Ostatnio zmieniony 06 stycznia 2018, 10:57 przez Tommy T.B., łącznie zmieniany 1 raz.